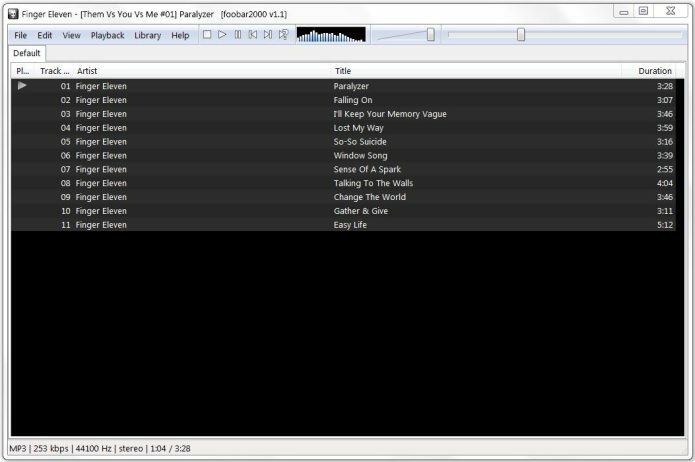 Today, I’m examining foobar2000, a lightweight audio player for Windows. It has many useful features, while avoiding the bloat of players like Windows MediaPlayer. foobar2000 is perfect for someone who likes to listen MP3s or CDs, but doesn’t want distracting visualizations or constant ads and suggestions for new music. foobar2000 does an excellent job of just playing the music and staying out of the way. The installation is simple, but you should take some time to customize the player to your tastes. Although the player (screen shot) resembles a plain window with audio controls, several different layouts are possible and most components can be repositioned and re-sized. Several themes are included for changing the player’s color scheme and the themes can be tweaked to further fine tune the appearance. Even though skins are not supported, foobar2000 is a tweaker’s dream. Performance is excellent. It sounds great and has an 18 band equalizer (screen shot). The player is snappy – playback starts without hesitation. It operated flawlessly for the last 3 months on Windows 7. Prior to that, on Windows XP, foobar2000 would occasionally crash when attempting to start playing after a long pause – not a big deal. The player supports all the common audio formats: MP3, MP4, AAC, CD Audio, WMA, Vorbis, FLAC and many more. Playlists are supported. MP3 tags can be edited, although this may need to be enabled in Preferences. Additional functions can be added through plug-ins, called Components. Other than the CD Writer, most of the components seem to be of little value to an average user. Negatives? Not many. Perhaps, some items in Preferences are rather esoteric. OK – just ignore them. foobar2000 does not play video. Fair enough, but I like that it is an excellent audio player and I use another player for video. Skins are not supported. Overall, I give foobar2000 two thumbs up. 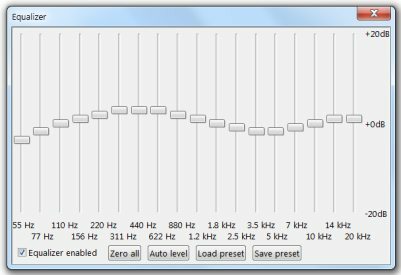 If you listen to a lot of music on you PC and want to try something simpler, more basic, this is just what you need – and it’s free. To enable the buttons on all posts go to ‘Settings’ (bottom of menu on left side) and select ‘Sharing’. There you can pick which buttons should appear. I hope this helps. oh yea how do you add the twitter fb etc share on your post?